Batting Practice: Water Balloons Revisited! The weather is heating up here in the hot desert. We have had to get creative in the ways we are staying cool this summer. We decided to revisit the idea of a water balloon fight, but we needed a new twist. Thank you to icandy Handmade for the great idea — Water Balloon Baseball! 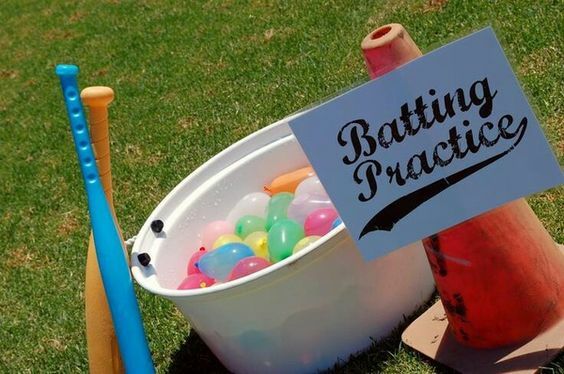 icandy Handmade created the coolest baseball birthday for her son, and we took the game idea — water balloon baseball — and turned it in to the best summer activity EVER! With just a bag full of water balloons (or several) and a couple of baseball bats you can be outside soaking up sun and busting balloons (and laughs) all afternoon. My husband thought he would have a laugh or two and replaced a handful of the water balloons with regular balloons. The kids became frustrated when the balloon didn’t bust on the first whack. Instead they had a great time hitting the balloon over and over. Water balloons are such a simple and fun summer activity. I can remember playing with my own siblings all summer long as a child tossing water balloons and dodging their attempts at hitting me with a balloon. As long as there is summer, there will be water balloons. Do not forget to head on over to icandy Handmade to check out her incredible Baseball Birthday ideas and see how much fun it was creating water balloon baseball! This entry was posted in Activities and tagged Activities, Baseball, batting practice, icandy Handmade, outdoor fun, outdoor games, summer fun, summer games, summer water games, the boys store, water ballon toss, water balloon baseball, water balloon games, water balloons, Water fun on June 22, 2018 by Lacy.